Mid Penn Bank recently broke ground on its new branch in Halifax Township. The branch, located at 3663 Peters Mountain Road along Route 225, is slated to open in the first quarter of 2018. Pictured at the groundbreaking are several members of the bank’s board of directors and executive management team. From left to right: Chief Retail Officer Kelly Neiderer, Director Robert Klinger, Chief Lending Officer Scott Micklewright, Board Vice-Chairman William Specht, Director Matthew DeSoto, Board Chairman Robert Grubic, Director John Noone, President and CEO Rory Ritrievi, Chief Financial Officer Michael Peduzzi and Director Steven Boyer. 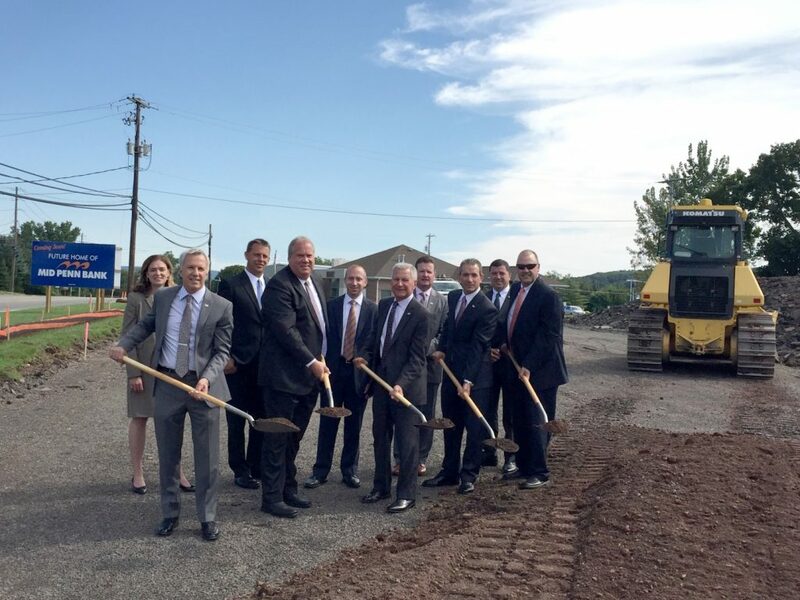 Mid Penn Bank, a subsidiary of Mid Penn Bancorp Inc. (NASDAQ: MPB), recently broke ground on its new branch in Halifax Township. The branch, located at 3663 Peters Mountain Road along Route 225, is slated to open in the first quarter of 2018. The branch will be a full-service retail location to accommodate personal, business, agricultural, nonprofit and municipal customers, and will be staffed by three to five employees. This press release, and oral statements made regarding the subjects of this release, contains forward-looking statements within the meaning of the Private Securities Litigation Reform Act of 1995. Such statements are not historical facts and include expressions about management’s confidence and strategies and management’s current views and expectations about new and existing programs and products, relationships, opportunities, technology, regulatory approvals and market conditions. These statements may be identified by such forward-looking terminology as “continues,” “expect,” “look,” “believe,” “anticipate,” “may,” “will,” “should,” “projects,” “strategy” or similar statements. Actual results may differ materially from such forward-looking statements, and no reliance should be placed on any forward-looking statement. Factors that may cause results to differ materially from such forward-looking statements include, but are not limited to, changes in interest rates, spreads on earning assets and interest-bearing liabilities, and interest rate sensitivity; prepayment speeds, loan originations, credit losses and market values on loans, collateral securing loans, and other assets; sources of liquidity; common shares outstanding; common stock price volatility; fair value of and number of stock-based compensation awards to be issued in future periods; the impact of changes in market values on securities held in Mid Penn’s portfolio; legislation affecting the financial services industry as a whole, and Mid Penn and Mid Penn Bank individually or collectively, including tax legislation; regulatory supervision and oversight, including monetary policy and capital requirements; changes in accounting policies or procedures as may be required by the Financial Accounting Standards Board or regulatory agencies; increasing price and product/service competition by competitors, including new entrants; rapid technological developments and changes; the ability to continue to introduce competitive new products and services on a timely, cost-effective basis; the mix of products/services; containing costs and expenses; governmental and public policy changes; protection and validity of intellectual property rights; reliance on large customers; technological, implementation and cost/financial risks in large, multi-year contracts; the outcome of future litigation and governmental proceedings, including tax-related examinations and other matters; continued availability of financing; financial resources in the amounts, at the times and on the terms required to support Mid Penn and Mid Penn Bank’s future businesses; and material differences in the actual financial results of merger, acquisition and investment activities compared with Mid Penn’s initial expectations, including the full realization of anticipated cost savings and revenue enhancements. For a list of other factors that would affect our results, see Mid Penn’s filings with the SEC, including those risk factors identified in the “Risk Factor” section and elsewhere in our Annual Report on Form 10-K for the year ended Dec. 31, 2016. The statements in this press release are made as of the date of this press release, even if subsequently made available by Mid Penn on its website or otherwise. Mid Penn assumes no obligation for updating any such forward-looking statements at any time, except as required by law.